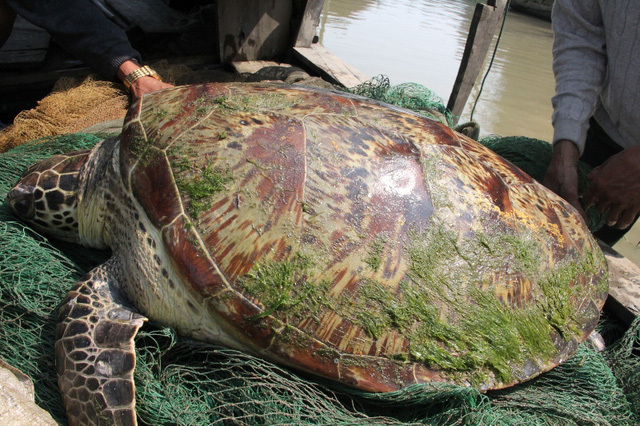 A fisherman in the central province of Ha Tinh released a giant sea turtle after he accidentally caught the giant animal in his nets on Thursday. Nguyen Van Cuong in Nghi Xuan District said that he found the turtle when fishing on the Lam River on Thursday morning. It weighed about 100 kilos. Cuong said this was the largest turtle he’d seen in five decades of fishing. The fishermen received a VND3-million (USD130) reward from the local authorities to repair his net which was damaged by the turtle. Dozens of villagers flocked to get a glimpse of the rare turtle and take photos.